Ever Wondered Why Hot Air Balloon Rides In Melbourne Only Take Place At Sunrise? 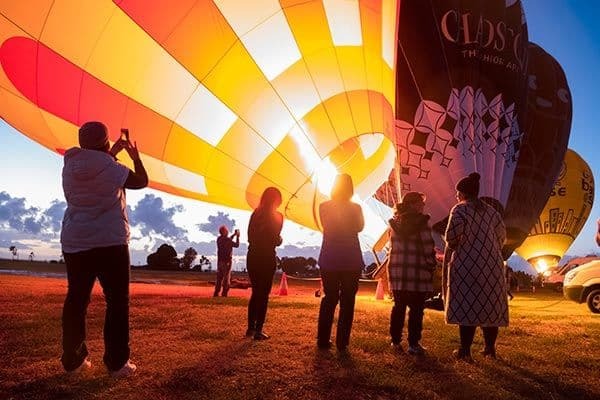 Why do hot air balloon flights occur only at sunrise? We’ve got the answers right here, and believe us, it’s more than just because the view is more beautiful. Safety is our number one priority. Several of our customers have asked us why we do not operate during the day and into the afternoon — so we’ve decided to give you a proper explanation. Before we delve into the science of it all, we’d like to ask you something? What better time is there to overlook Melbourne’s Royal Botanical Gardens than at the gentle peacefulness of the stillness of dawn? For the envelope (this is the actual balloon) to rise the pilot heat up the inside of the envelope with hot air to cause the air inside the balloon to become less dense and lighter than the air outside the envelope. When this happens, the balloon can lift. The amount of lift depends on the difference between the temperature of the air inside the balloon and the temperature of the air outside the balloon. Sunrise is the ideal time for pilots to utilise the cooler calm conditions. The temperature during the day increases, and by midday, the rising temperature from the ground causes a phenomenon called Thermals, which are like long columns of air pockets that rush up and down. The Thermals can cause drafts in the atmosphere, which would directly affect the control a pilot has on the hot-air balloon. Typically, during the day, the fast-moving air at higher altitudes mixes with the cooler and slower-moving air from the curvature of the earth, which can cause gusts of particularly unpredictable winds. Of course, this will affect the level of control pilots have, regarding steering and managing the buoyancy mid-air. Think of the great places you can see while flying over Melbourne: we often fly over sites such as the Royal Botanical Gardens, Yarra River, Rialto Tower, Arts Centre and so many other of our pristine parks, gardens and wonderful landmarks. Call us today on 1800 HOT AIR (1800 468 247) or Book Online Now and enjoy a once-in-a-lifetime experience you’ll never forget.